from 2 Pcs. from 3 Pcs. Dietary supplements. Extract from coconut oil, dimethylsulfon (MSM), vitamin C.
Recommended dosage: 1 teaspoon (5 grams) per day. Take with water or fruit juice. The recommended daily dosage should not be exceeded. Dietary supplements are no substitute for balanced and varied diet. Store light protected, sealed, out of the reach of small children, away from heat and in a dry place. Close container tightly after ingestion. 1-Lauroyl-glycerol (Monolaurin). Nutritional reference value per serving: not defined. 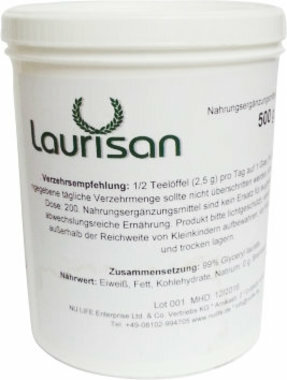 Free shipping due to a order value of 100.00 when delivering to Germany. Write an online review to this article and communicate your thoughts to other customers! General notice regarding customer reviews: Experiences with a product can be very subjective. A direct transfer to other persons is not possible without question, a success cannot be guaranteed. How to place an order! Free shipping within DE for orders from 100 €, for surrounding countries from 500 €, for EU from 1000 €. Copyright © 2003, 2019 NU LIFE Enterprise Ltd. & Co. Vertriebs KG We are only satisfied, when you are thrilled! We are satisfied only when you are thrilled!